It’s actually been almost a year since we closed on our house, and Sharon is still the one we contact when we need a Cranford recommendation! My husband and I met Sharon at an open house when we were not quite ready to start looking, and she kept in touch until we were ready to jump in. She took the time to sit and meet with us to fully understand what we were looking for. Sharon was always very responsive to our messages and accommodating to our travel situation–we were moving from Brooklyn and didn’t have a car. Sharon and her assistant worked hard to make sure our trips were productive, lining up multiple houses for us . . . and they even provided us a ride! That time ended up being wonderful to get to know Sharon and pick her brain–she is so knowledgeable about the house-buying process and the Cranford/Scotch Plains/Fanwood area. Our mortgage company, attorney, inspector, insurance agent. plumber, and hardwood floor contractor were all recommendations from Sharon. 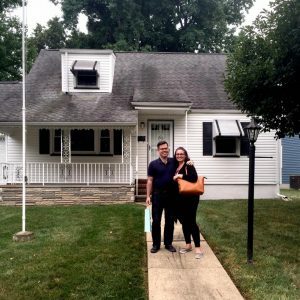 There was no question too big or small for her, and as first-time buyers, we had a lot of questions. She walked us through every step of the process, and it felt so smooth. Thank you, Sharon!